Happy Tuesday! Welcome back to another Toddler Approved Tuesday. 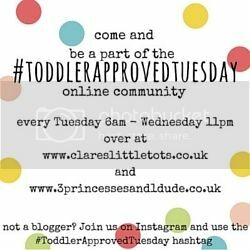 We’ve got a new badge this week to celebrate our decision to turn the Toddler Approved Tuesday Link Up into a community! We’ve had fun last week making this Rock Monster Family and we’re now about to make a little house for them using an old shoe box. My lovely co-host Becky at 3 Princesses and 1 Dude has been busy with this How Many Flowers? Busy Bag for her Little Monsters. My two favourite link ups from last week were this beautiful post from Play at Home Teacher – Dinosaur Footsteps and Balancing Beams. and this Making Marble Painting Wrapping Paper from LarabeeUK looks like a LOT of fun!